It's weird to be able to see the end of this year's show season. I went into this one with no plan and no expectations (unlike last year, when I was very much points chasing). This year, I am so much more obsessed with how much Connor and I have learned/changed than I could ever be over points or year end awards, I didn't think about or check points once this whole show season. Like, uh, this was two years ago this month. So I still kinda can't believe this is a picture of me. But, turns out I did qualify for my GMO's championships somehow, so I'll be riding 1-3 again on September 30 for that. And then it logically follows that I'd use the last rated show of the year to practice 1-3, so I'm doing 1-3 both days for that show in mid-August. I hate it because it's hard for us, and I hate it because it always seems to kick our butts, and those are not valid reasons to avoid it; really, they are reasons to attack it. We're going to spend all of this month and next month schooling like we're chasing 2nd level, but practicing the first level movements. 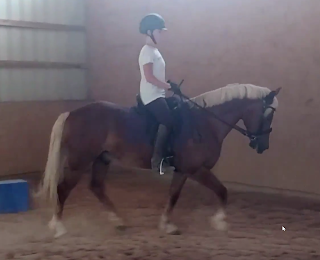 I won't say it's the last time we'll show First Level (because there's no way we'll be championship show-caliber ready at 2-3 by National Dressage Pony Cup 2018), but I'm going to ride those tests as if it is and school 2nd over the winter like we're done with First. Dear Karen: Thank you for your upcoming reservation at Chez Jen and Nick! Please inform us of any special requests you may have prior to your visit and we'll make sure they're all taken care of. Enjoy your visit! Those middle two photos! Big difference! Good luck with the rest of your season. Congrats! Best of luck at the mid-August show and we will see you at Championships end of Sept! Woohoo! Congrats on qualifying and I'm so excited that you're planning on NDPC 2018! Congrats!!! Roscoe is up for Intro champ at our little show series, but I am determined to move up to Training so I am letting it go. So glad to see all your breakthroughs. Damn that recent pic of you... GORGEOUS!!! !